Do you share your birthday with famous people born on February 20? 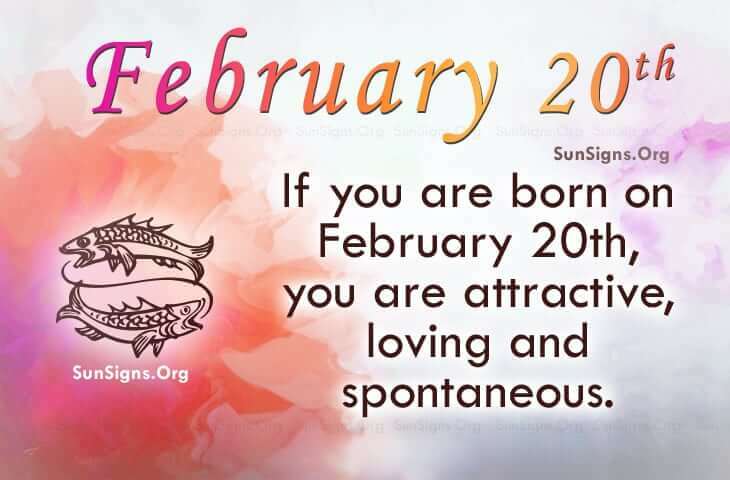 IF YOUR BIRTHDATE IS FEBRUARY 20, then you are a Pisces who is full of awesomeness. You are attractive, loving, and you like doing things on the spur-of-the-moment. However, when traveling famous people born on February 20 don’t like to be bogged down with the details. They would prefer to have a buddy to come along with them. They have a great mind for inventions. They can turn an empty aluminum can into a piece of art. Not many have this talent. Like the famous birthdays celebrated today you are truly something to be desired and as it stands, a lot of people do. Nonetheless, they are a romantic at heart and would never cheat on their lover. They do have a negative quality though. Famous people born on February 20 tend to latch on to their partner and this could be a turn off. In addition to that, they can be a wee bit too jealous. They need to cut that out as this is not a good thing. If you are born on the same day as famous people on February 20th, you are down-to-earth. People are attracted to you. Today’s birthday horoscope shows that these Pisceans are dreamers and are extremely romantic. They find fun and excitement in their dreams. They also are likely to be musically inclined but are insecure. Nevertheless, they know how to handle their money efficiently. Take a look at a comprehensive list of famous birthdays for February 20.